[New for 2013, returning 2014 (May-Aug), back in 2015] I had no intension of releasing this review today, but seeing as how June 11 is National German Chocolate Cake day, I kind of feel obligated to do so. You know I'm not a big fan of coconut, but after trying the excellent Talenti German Chocolate Cake and more importantly the respectable Edy's Caramel Coconut Cookie, I think I might be ok with this one. 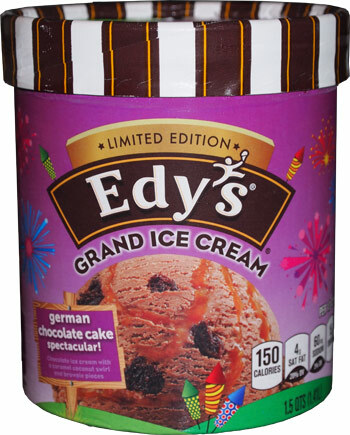 "Chocolate ice cream with caramel coconut swirl and brownie pieces" makes up Edy's / Dreyer's german chocolate cake spectacular! grand ice cream. I'm not a big fan of exclamation points in names because I think it sets the bar too high. I also have no idea what any of this has to do with fireworks, but I dig the colorful packaging none the less. The opening shot was boring, and digging down a inch or so isn't much better. The brownie bits are tiny and few. The caramel swirl is hiding. Expectations have been lowered. The first small sampling of this one was... well, I gave this to my daughter first and she was unamused I tried to pawn a coconut flavor off on her. I decided to try a few scoops myself and I knew what she meant. It's not a bad ice cream, it's just not as exciting as I had hoped. I wanted the caramel to be more prevalent to balance things out. I wanted way more brownie bits to distract me. I'm sure people will like this, but it's just not going to have a broad appeal. The packaging is way more exciting than the ice cream. On Second Scoop: Ok, let's try this again. 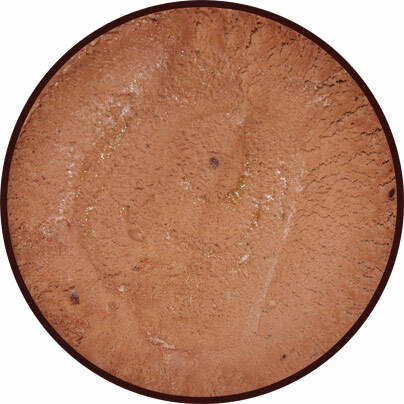 First, the base is a fine milk chocolate ice cream, no complaints there. Second, we've got the very effervescent coconut. It's not a crazy strong flavor, and the little bits of coconut are at a minimum. Third, the brownie bits are small but decent, plus they don't seem that plentiful. Lastly, where is the caramel flavor? I see the swirl but I can't taste it. It's not that it's a bad ice cream, it's just that when you advertise caramel, and you advertise it's spectacular, then I'm going to expect a lot more. Verdict? decent, but where's the caramel? This ice cream sounds like a firework that breaks on the ground - a dud and NOT spectacular :( P.S. I think they went with the spectacular theme because of the summer release which usually means fireworks. Maybe you got a "dud" . . . I tried this about 2-weeks ago, and while I agree that the caramel was not plentiful, and didn't give much of a taste to the ice cream, there were plenty of brownie pieces..they were everywhere. yeah, that's totally possible, always is unfortunately, but I didn't enjoy the base enough to warrant another purchase. I hate the texture of coconut but am crazy in love with the flavor. I love brownies, caramel and cake. Is it worth it? Do you think I'll like it? so you like coconut flavor but not coconut texture? then yeah, you should be fine. OH no! This was in the Grocery Outlet for $1.99 in September! I totally missed it!